Synopsis: In 45 Years, a married couple preparing to celebrate their wedding anniversary receive shattering news that promises to forever change the course of their lives. When the Academy Awards nominations were released a couple of weeks ago, one of the pleasant surprises on the list was Charlotte Rampling’s nom for her performance in 45 Years. Not because she’s not deserving; far from it, as the actress who has appeared in everything from hokey horror movies like Orca to cable television dramas such as “Dexter” delivers her finest performance to date. The surprise stems from the fact that, so far, the film has had a very limited release and not a lot of people have gotten a chance to see it. Well, now that the movie is starting to trickle into more theaters, audiences will see that Rampling’s nomination is completely justified. In 45 Years, Charlotte Rampling plays Kate Mercer, a woman who is about to celebrate her forty-fifth wedding anniversary with her husband, Geoff (Tom Courtenay from Doctor Zhivago and Billy Liar). In the midst of all of their party planning, Kate and Geoff receive an ominous letter which states that the body of Geoff’s ex-girlfriend, a woman named Katya who slipped into a crack in the ice while exploring a glacier some fifty years earlier, has been recovered. Because they were pretending to be married at the time of her disappearance, Geoff is considered Katya’s next-of-kin. All of this comes as a surprise to Kate, who suddenly realizes that, even after forty-five years, she still doesn’t know her husband quite as well as she thought she did. Written and directed by Andrew Haigh (Weekend), 45 Years was adapted from a David Constantine short story called “In Another Country.” Haigh switched the main focus of the tale from the husband to the wife, thereby giving a much more mysterious air of drama to the story. All things considered, it’s a very subdued movie; the mistrust that chips away at the Mercer’s marriage is a volatile subject, but the movie itself is calm and articulate. The audience waits and waits for a fuse to blow, but it never really happens – at least not in the way that is to be expected. The movie has a fairly consistent arc of melancholy which doesn’t ever boil over into frenzy. There is a lot of heavy stuff simmering underneath the surface of 45 Years, though. By purposely keeping the characters rational and thoughtful, Haigh is able to make the audience both think with their heads and feel with their hearts. There are no heroes or villains in 45 Years, just a couple of people in love who are trudging through a rough patch in their relationship. Just as the ice kept Katya’s body hidden from the rest of the world for all of those years, Geoff kept his ex-girlfriend’s memory hidden from Kate, and although Kate is hurt and confused, her love for Geoff never wavers, even when her faith in him does. That’s the sweet thing about 45 Years; the question is not whether Kate and Geoff will work it out, but how they will. If there’s a complaint about 45 years, it’s the fact that the film feels a bit padded, which makes sense since the source material was a short story. Still, if nothing else, the extraneous scenes allow the audience more time with Rampling and Courtenay, and that’s not a bad thing. Not a bad thing at all. The story is alright, but the characters make 45 Years great. In a movie that’s as character driven as 45 Years tends to be, it goes without saying that the acting has got to be top-notch. And it is. Charlotte Rampling earns her Oscar nomination; her portrayal of Kate, fierce yet kind, suspicious but still longing to believe, carries the movie. Tom Courtenay holds his own as well, playing the vulnerable Geoff as a man conflicted in his emotions and feelings, loving his wife but also still carrying feelings for his long-lost girlfriend. Together, they bring a unique chemistry to the table as they dance around the issue that quietly shatters their comfortable little world. The casting is just as important as the performances in 45 Years. 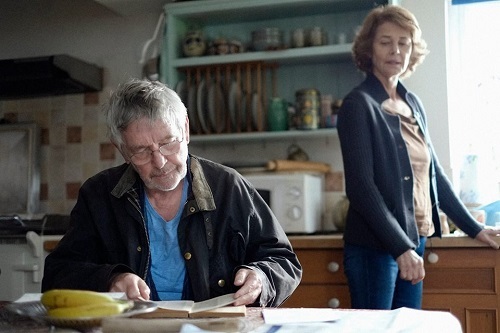 The fact that both Charlotte Rampling and Tom Courtenay have not only been around for so many years, but have been in the public eye for all that time as well, makes it easy to believe that they have been together for as long as their characters have. The audience doesn’t have to imagine what they looked like 40 years ago, because they’ve probably already seen it, and that only helps to make their characters more authentic and genuine. There is very little (if any at all) noticeable musical score in 45 Years. Instead, the soundtrack is made up of the diegetic music in each scene, songs played by the characters that drum up old memories from their many years together, both good and bad. The musical selections include popular numbers like Dusty Springfield’s “I Only Want to Be with You,” Lulu’s “To Sir with Love,” and The Turtles’ “Happy Together” – songs of that ilk. Surprisingly, 45 Years works better without a traditional score. The deafening silence gives the film a quiet distinction that seems almost as if it is giving the characters room to breathe. The music is used frugally, but the songs that are played fit the mood of 45 Years like a glove.